A gentle face exfoliant rich in seed oils and our biodynamic spelt oil which helps to nourish and hydrate the skin during the process of exfoliation, leaving the skin soft, smooth & receptive to the moisturising products to follow. Apply after cleansing to damp skin in a gentle circular massage movement using the finger tips, to effectively exfoliate the skin. Rinse well with lukewarm water. Either exfoliate morning or evening but NOT both. If hypersensitive do not exfoliate. Mature skin exfoliate 1 time per week. Normal / Dry / Sensitive skin exfoliate 2 times per week. Combination / Oily skin exfoliate up to 3 times per week. All AEOS products are highly concentrated. A little goes a long way, so please use sparingly. 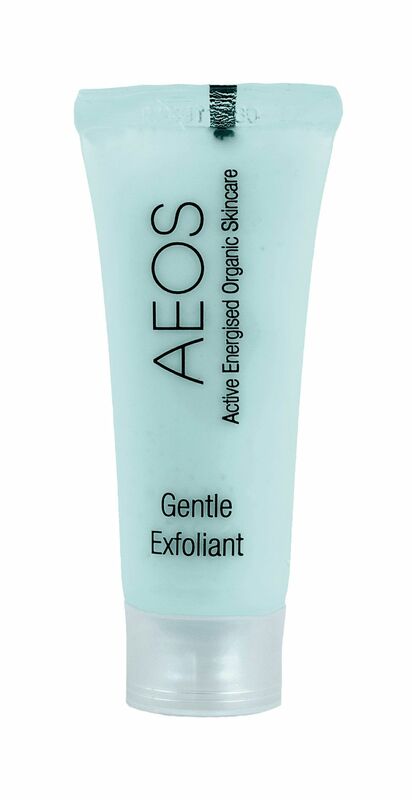 Always apply AEOS products to damp skin. Spelt Oil, Jojoba Oil, Hazelnut Oil, Avocado Oil, Argan Oil, Sweet Almond Oil, Rosewater, Calendula Extract, Lemon Myrtle Oil, Lavender Oil. Colour: 100% natural and plant derived blue from blue chamomile flowers. Extract, Arginine, Backhousia Citriodora (Lemon Myrtle) Oil, Lavandula Angustifolia (Lavender) Flower Oil, Squalane (Vegetable), Guaiazulene, Limonene*, Linalool*, Citral*.